In the beautiful Victorian setting of Brighton's Concorde 2 you could see, in both the architecture and the audience, a well suited mix of new and old. Such contrast also stretched onstage where the one and only band of the night, Tinariwen, mixed traditional Touareg style with Western rock 'n' roll. Unusually, there was no support band, but, even more surprisingly, there was no need of one. Despite the distinctly autumnal night outside, this audience was already warmed to the point of combustion. As the throng of anxious bodies bristled with anticipation, suddenly, out of the excess of smoke, appeared the formidable outlines of a group of men able to ignite any room they choose. Never appearing overly polished, it's incredible to see a band that have played Glastonbury translate so comfortably to such a tiny stage. "Welcome to the desert" was their greeting and true to their word, the transportive power of their music took us all the way back to the Sahara in Mali where this whole story first began. Never losing sight of their roots has been one of Tinariwen's greatest strengths and they displayed their heritage in both their robes and the tender power of their sound. Joining several of the founders onstage were members of the new generation of Malian talent. Both inspired by, and yet equal to their elders, they injected a vibrant spirit into the band's performance in Brighton. 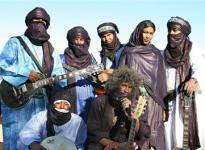 Confident without being arrogant, Tinariwen's live show displayed their talents, not only as musicians, but as performers. Given the intimate nature of the venue, they were able to connect closely with the audience and really get them to interact meaningfully with the music. Hand claps managed to play an intrinsic role within the percussive flavour of the music and also the playful call and response between musicians and crowd. Gradually, barriers between the artists and observers blurred as the room equalised, without losing dynamism. Drawing influence from a plethora of different genres, the set ranged from dub bass to country acoustics with a sitar style Indian inflection for good measure. Despite muddiness to the sound quality during the first half, Tinariwen have certainly proven themselves to be one of the most talented and rousing live acts around.